Old Charlie Brown blew away new Muppets. ABC: IT’S THE GREAT PUMPKIN, CHARLIE BROWN, at the end of its first half-century of broadcast life, earned a 2.0, far ahead of last week’s 1.3 for THE MUPPETS. It was followed by a rerun of TOY STORY OF TERROR, which at 1.6 was also ahead of last week’s 1.4 for FRESH OFF THE BOAT. 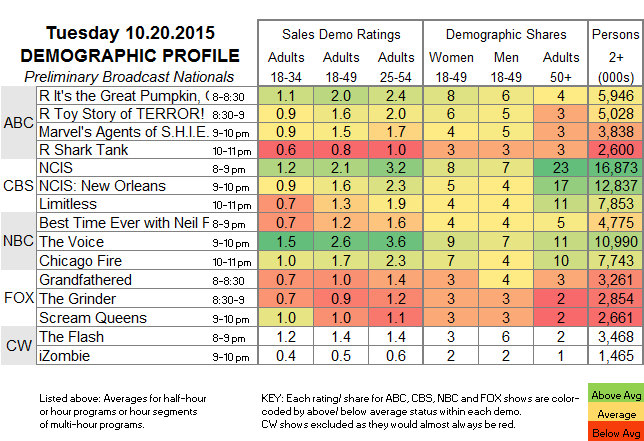 AGENTS OF SHIELD edged up 0.1 to 1.5, and the night ended with a 0.8 rerun of SHARK TANK. NBC: BEST TIME EVER and THE VOICE were steady at a respective 1.2 and 2.6. CHICAGO FIRE lost 0.1 to 1.7. FOX: GRANDFATHERED, THE GRINDER and SCREAM QUEENS have found their levels, all holding at last week’s 1.0, 0.9 and 1.0. 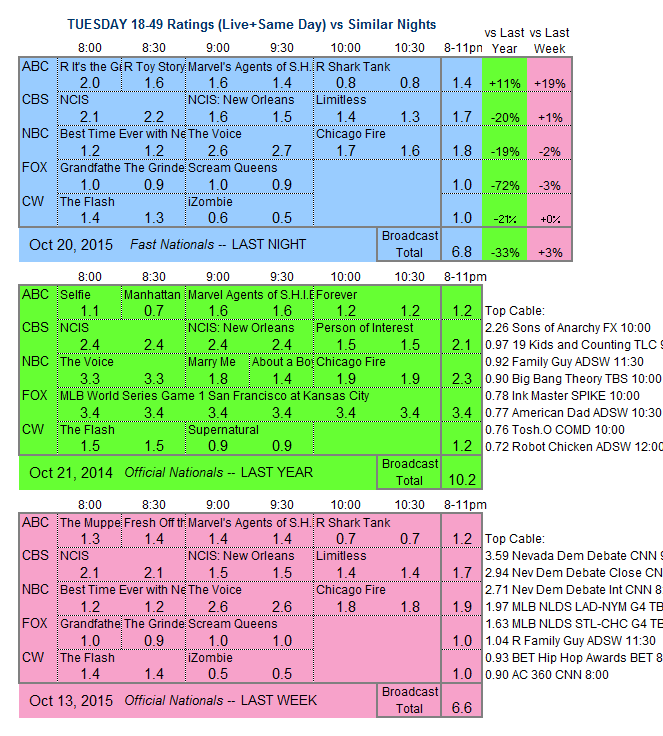 CBS: NCIS stayed at 2.1, and NCIS: NEW ORLEANS was up 0.1 to 1.6. LIMITLESS, though, lost 0.1 for a new low 1.3, 0.2 below where PERSON OF INTEREST was in the parallel week last year. CW: THE FLASH and IZOMBIE remained at 1.4 and 0.5. All the networks air fresh episodes tonight.